From the maker of Ghetto Azeroth comes… GHETTO STAR WARS!!! 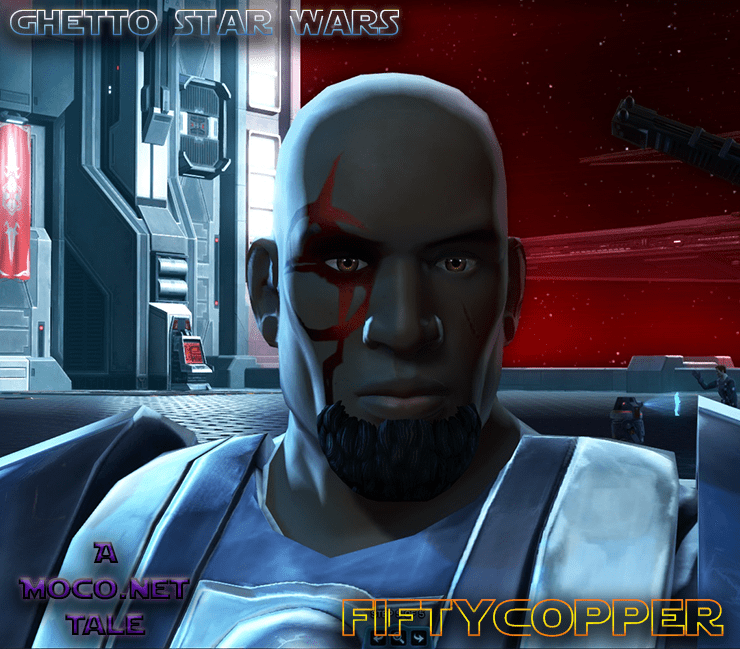 Join FiftyCopper Moço as he traverses planet to planet, voyaging across the galaxy to fulfill his duties as a Sith Warrior, and crushing anyone in his path. This ain’t no nice sith! Hit the jump for more. Hello once again everyone, it is time to start a new journey, in a new game, in a different style, in a bla bla bla. I had a lot of fun role playing Fiffty Copper in World of Warcraft, but in the end, unfortunately, I got sick of it because it was so demanding. After what seems to be a year taken off of playing Star Wars Knights of the Old Republic. I am back and feeling refreshed. So what is there to do? Bring Fifty Copper’s fresh point of view of course. I will be playing a Sith Marauder, a dual light saber holding beast. He will not be a kind person, although he might show mercy every now and then. I think it will be a lot of fun to play. SWTOR is different than your typical MMO, as it is more story based. Each class has their own story and it cost a record millions of dollars to make. Here are some of my golds I hope to achieve. Thank you for your time and I hope you enjoy reading!